It was pitch black, and the wind screamed across the wild ocean creating huge waves. Cappy was weary and lost. As the freezing spray silently thickened on his wings, he slowly began to glide downward to the fury of the sea. With a desperate burst of energy he beat his wings, trying to stay aloft, but it was no use. He glided closer and closer to the waves and certain death. Follow the adventures of Cappy, the arctic tern, as he struggles through ferocious winds to find his summer home, searches for a new mate, battles the selfish jaegers, befriends Eskimo children Ory and Em, and starts a family of his own. 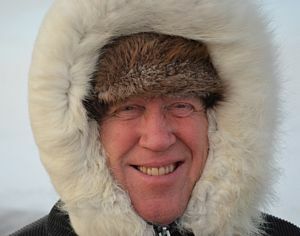 Kenneth Crawford loves children and also loves nature in the Arctic. He has lived in Alaska many years and spent quite a bit of his time around birds and animals in the north. He is president of the Seventh-day Adventist Church in Alaska.